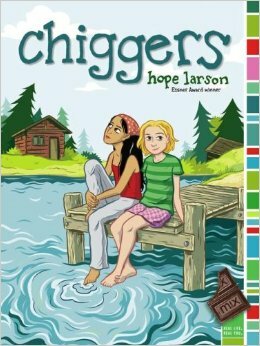 Chiggers by Hope Larson. Atheneum Books for Young Readers, 2008. Face Value: This is a solid graphic novel cover. Larson’s artwork is cheerful and conveys the summery camp setting. There is a slight disconnect between the girls on the cover, Shasta and Abby, which hints at the drama that will come from their interactions at camp. Does it break the slate? No, it doesn’t. But that doesn’t mean it isn’t a good book – it is still worth sharing and discussing with girl readers. Abby doesn’t stand up for herself or Shasta in the way that she could, but that’s part of her learning process. By the end of camp she knows herself better and has the potential to navigate conflicts better in the future. Who would we give it to? The summer is coming and girls are preparing to head off to camp. Experienced campers and first time campers would enjoy this book. Although the characters are heading into high school, the book seems to skew younger than that, so I would recommend this for middle school readers. Review: Abby is a summer camp pro. She has looked forward to returning to camp where she can bond with her old friends and enjoy the supportive environment. But when Abby comes back to camp, she finds that her friends have grown up and she doesn’t feel like she can keep up with them. They have boyfriends and hobbies and future plans, while Abby just isn’t sure what she is passionate about. When a new girl, Shasta, shows up as her bunkmate, Abby is finally able to make a connection. The problem is that Abby’s old camp friends don’t like Shasta. Although Abby can’t keep up with them, she is trying, and her connection with Shasta is throwing a wrench into her popularity plans. Abby has to figure out how to maintain her friendship with the quirky Shasta while still being accepted by her old friends. It’s a delicate balance, and she doesn’t always do it well. Abby manages to upset both Shasta and her long-time camp friends during the summer. Abby and Shasta are girls who enjoy things that aren’t “conventionally girly” – and that’s part of what makes them struggle to fit in, even in a camp setting where most of the youth campers would identify as outsiders. Shasta and Abby find commonalities in their enjoyment of fantasy stories, and they both crush on the same boy who is an accomplished Dungeon Master. I appreciated the way that Larson illustrated the awkwardness of forming a new friendship and the stress of trying to keep up old friendships. All of the moments of discomfort are captured in Abby’s facial expressions and posture. Larson certainly knows how to capture the lack of assurance that middle schoolers tend to exhibit. Although Abby doesn’t always make the most bold or admirable decisions in her friendships, she is a girl character who is working to improve herself. Chiggers shows how a young woman can grow from her mistakes. The book also shows the potential for a person to grow while at camp, which may provide comfort to young people headed to camp for the first time and worried that it won’t be worth it. This book would be best followed up with a conversation about how you treat your friends, and why it’s important to be upfront with people about who you are and what you want. It’s a good read to prepare for summer away-from-home experiences. This entry was posted in Graphic Novels, Reviews and tagged Friendship, Summer, summer camp. Bookmark the permalink.